A kamado grill is an ancient name for a ceramic grill, particularly one that is traditionally in the oblong "egg" shape. The most well known modern version of a kamado style grill is the Big Green Egg Grill. The general theory behind these types of ceramic grills is that ceramic is a much better insulator for both heat and moisture than most metals. Therefore, these grills are often very efficient and precise temperature control is possible. In theory, they also help preserve moisture within the grill, even at high heat, keeping your food juicy and succulent. There are several other brands that make similar kamado grills. Some of the better known include the Primo Grill, the Grill Dome and Kamado Joe. The Kamado Joe is a specific brand of kamado style grill, pictured above. While most ceramic grills are quite expensive, the Kamado Joe is a bit more on the affordable side. It is not cheap. It will still set you back several hundreds of dollars. But compared to comparable grills from Grill Dome and the Big Green Egg, it is a bit less expensive. The Kamado Joe grill comes in black or red and has an 18" diameter cooking surface (round), which comes to 407 sq inches, the same as the large Big Green Egg. Despite its cheaper price, these are outstanding ceramic grills will most of the same features and options that the other more famous brands offer. Definitely worth a look if you are in the market for a ceramic grill. They are now available through SpitJack.com! One of the best places I know to buy supplies for cooking with fire is SpitJack.com. Besides being one of the best options for fireplace cooking supplies (fireplace grills, rotisseries, cranes, long-handled roasters, etc. ), they have a uniquely chosen stock of other great accessories. Their own fire pit rotisseries for pig and lamb roasting are top notch and sturdy. They also have fire pits, firewood storage and splitting supplies and more! Ceramic grill options they carry include the stunning Primo Grill as well as the Kamado Joe. Check them out! 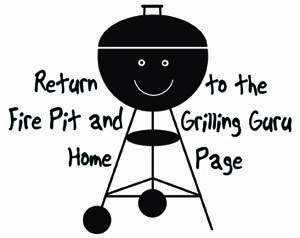 Done with the Kamado Grill page? Return to the Ceramic Grill section.